Mulled wine is a classic combination of red wine and spices that are warmed together, making a wonderful festive drink for the holiday season or whenever you're feeling a little chilled. Mulled wine is easy to make at home and will impress your guests way more than a mug of hot chocolate. What Does it Mean to Mull Wine? Mulled wine is a common drink in regions of Europe. It is known as Glühwein in Germany, vin chaud in France, and vin brule in Italy, where it is mostly consumed in the north. The Swedish have a drink called glogg, which is quite similar to the German beverage and includes red wine, cinnamon sticks, cloves and sugar. Sometimes orange juice is also added. The idea behind mulled wine seems to be a way to use everything, even wine that had gone bad. Adding spices and honey to the wine made it more palatable, even if it was a little past its prime. There are all sorts of red wines that would be good for mulling. Here's a chance to use a bottle that wasn't very expensive, and perhaps a bit disappointing, in a pretty fancy way. You don't want to use the cheapest table wine for this application, but don't throw down a lot of change for a fancy bottle, either. A full-fruited red that costs around $10 will be your best bet for mulling. A Shiraz, Merlot or Cabernet Sauvignon from Chile, Spain, or similar climes will work very well. Experiment to find your favorite. Like just about anything else under the sun, there are many variations on the recipe for mulled wine. It is quite simple to make from this basic recipe. Wrap the cinnamon sticks and cloves in a cheesecloth square and tie off to make a pouch. Place all ingredients, including the cheesecloth bag, into a crockpot and let warm on low heat until warm to the touch. You can also do this on the stove, just make sure that the mixture does not come to a boil. Lisa's Mulled Wine Page has some historic recipes, as well as information about eggnog and other holiday drinks. The BBC has a recipe for gin lovers. Epicurious has a recipe with a lot of spice. There are several recipes for holiday beverages on LoveToKnow. Food Network has a recipe from Cookworks. 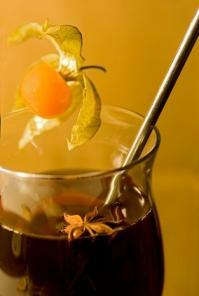 A mulled wine recipe from the Just Hungry blog has some beautiful images. Mulled Madeira is a recipe that is a little sweeter than mulled red wine. Mulled wine is not just a holiday beverage. It is a welcome drink at the end of a blustery autumn day or on a chilly March evening. Serve it with some cheese and crackers for a welcome snack in front of a roaring fire. Because you can make it in a crockpot, mulled wine is perfect for entertaining during the cold months of the year. This versatile drink is a must have for your recipe collection.